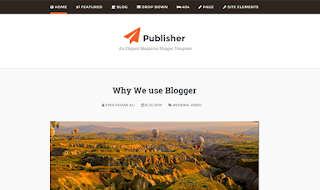 Publisher Blogger Template is a elegant, simple, responsive, high-quality classic blog designed blogger templates. It has full-width display which gives it a classic blog touch, but we have given it a great latest touch by adding some of the most professional features that a classic blogger template never had. If you have a blog, and are looking for a simple free blogger templates than Publisher is just made for you.